With corporate Christmas party season upon us, the question is this: how do you have a real, non-work conversation with Susan from accounting? I mean, she’s nice and all. But normally, there’s the Cartersville Project to discuss. What do you say when you’re standing next to the punch bowl with a co-worker and you’re expected to have a more social, non-work conversation? In helping our clients learn how to build relationships, we urge people to adage: “The secret to being interesting is to be interested.” With that in mind, if you want to be the life of the Christmas party, don’t get drunk and put a lampshade on your head. Be the person who shows interest in his or her co-workers’ lives and really listens. Question # 1: Are you planning to go anywhere for the holidays? This is a great conversation starter. Just about everyone has some plans for the holidays. Often you can get your colleague to regale you with stories about ski trips or last year’s trip to visit the in-laws. Question # 2: Does your family have any holiday traditions? When one of our coaches visits his wife’s family, they always set up the old model train set and make a gingerbread house. One year the house was so elaborate that it was entered in a magazine contest (it lost). Question #3: Ask about the kids. Everyone loves talking about their kids. And usually, they’re interesting. How is little Jimmy doing with tennis? How is little Susie doing with her soccer team or Girl Scouts? They make great eye contact. It’s easy to tell a poor listener. They’re the ones that are constantly looking around, checking out what else is going on at the party. 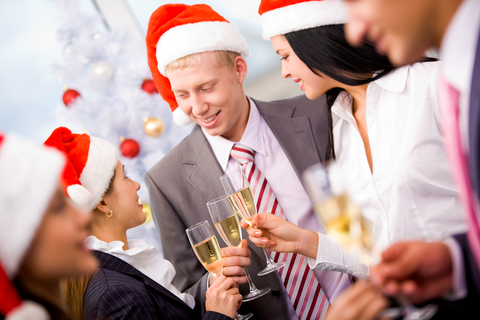 Many people look at office holiday parties as a chore because they feel they have to go but they don’t really want to be social with their office mates. But that’s the wrong attitude. Arm yourself with some questions and good listening skills and you’ll be the life of the party. More importantly, you’ll have a good time.